Background: ADEM, although relatively uncommon, is probably under-recognized. Objectives: To spotlight the clinical profile and therapeutic outcome of children with ADEM. Materials and Methods: This is a prospective study of patients with ADEM who were admitted to the Pediatric Departments in Aladan and Alfarawanya Hospitals in Kuwait, from January 2009 to January 2011. Clinical, microbiological and radiological data were analyzed. Results: Of 48 patients presented with acute neurological symptoms and signs, 21 patients fulfilled criteria for ADEM. 80.95% of cases were presenting in winter and spring, 57% of patients had a history of upper respiratory tract illness. The commonest presentations were motor deficits, convulsions and altered consciousness. CSF virology studies showed herpes simplex virus (HSV) and Epstein-Barr virus (EBV) (3 patients) whereas nasal and nasopharyngeal swab showed evidence of influenza H1N1 virus (1 patient). Brain MRI was performed in all patients and revealed multiple hyperintense supratentorial brain lesions on T2/FLAIR images. 85.7% of patients had cortical and/or subcortical white matter lesions which were bilateral and asymmetric in location and size. Conclusion: ADEM although rare must be considered in children with acute onset of neurological signs and symptoms and must be distinguished from any acute neurological insult. The objective of the present study is to clarify ADEM with an emphasis on the relationship of clinical features, microbiology, neuroimaging, and treatment to clinical outcome in 21 Kuwaiti children with ADEM. This is a prospective study of patients with ADEM who were admitted to the pediatric departments in Aladan and Alfarawanya Hospitals, Kuwait, from January 2009 to January 2011. During the period of the study, all patients who presented with acute neurological symptoms and signs were subjected to thorough history taking, complete physical and neurological examinations. All patients were subjected also to complete blood count with blood film, liver function tests, renal function tests, blood culture and sensitivity, creatinine phosphokinase, and cold agglutinin. CSF examination was carried out for all the patients within the first 24 h of admission. CSF examination included biochemistry, gram stain, cytology, latex agglutination, culture and sensitivity for bacteria, and virology studies. Polymerase chain reaction (PCR) tests for enteroviruses, herpes simplex virus (HSV), Epstein-Barr virus (EBV), and Mycoplasma pneumoniae were carried out for pharyngeal and nasopharyngeal swabs, blood and CSF, whereas enzyme-linked immunosorbent assay for rotavirus (in stool if there was concurrent history of diarrhea) and immunoglobulin G (IgG) and IgM antibody tests for viruses and M. pneumoniae. In the case of antibody titers, IgM-specific antibody levels, and rising IgG-specific antibody levels were considered significant. Brain CT and MRI scans were performed for all patients. Spinal MRI scans of the cervical, thoracic and lumbar cord were also performed for 13 patients who had spinal related neurological symptoms. Clinical follow-up of all patients after discharge from hospital with brain and spinal MRI scans for the degree of improvement, new lesions, and enhancement. The first follow-up visits were after 3 month of the presentation. The diagnosis of ADEM was based on the acute onset of neurologic signs and symptoms together with brain MRI evidence of multifocal, hyperintense lesions on T2-weighted images. Demographic data, clinical symptoms and signs, laboratory results, CT and MRI findings, and treatment response were tabulated. SPSS program version 16 was used to analyze data. During the period of the study, 48 patients (26 males and 22 females) presented with acute neurological symptoms and signs, among them 21 patients (12 male and 9 female) fulfilled the diagnostic criteria for ADEM. The demographic and clinical characteristics of our patients are summarized in [Table 1]. The patients ranged in age from 2 years to 12 years with a mean of 7.5 years. The patients showed a seasonal distribution with 80.95% (17 of 21) presenting in winter and spring (December to May). Only one case (4.8%) occurred in summer and 3 (14.3%) in late fall. 57% of patients (12 of 21) had a history of upper respiratory tract illness mostly 4 weeks before presentation. One patient had a history of measles, mumps and rubella vaccine, and two patients had a history of acute gastroenteritis. The most common presentation was motor deficits (as ataxia, paraparesis, hemiparesis, and monoparesis). Convulsions (either generalized or focal or even status epilepticus) followed by altered consciousness were the second and third common neurologic sign/symptom. One patient presented with eye aches and visual disturbances and another 2 patients presented with oculomotor nerve palsy. Only one patient had urinary symptoms as transient retention of urine and two patients had sensory deficit. [Table 2] showed the laboratory features of our patients. The white blood cell count ranged between 3200 and 29200/mm 3 with a mean of 11,300 cells/mm 3 . CSF evidence of inflammation (either pleocytosis or elevated protein) was present in 16 patients (76.2%). The CSF leucocytes count ranged between 0 and 1400 with a mean of 50.6 cells/mm 3 . The CSF protein ranged between 45 mg/dL and 2200 mg/dL with a mean of 89.7 mg/dL. CSF glucose concentrations were normal in all patients. None of the bacterial cultures was positive. 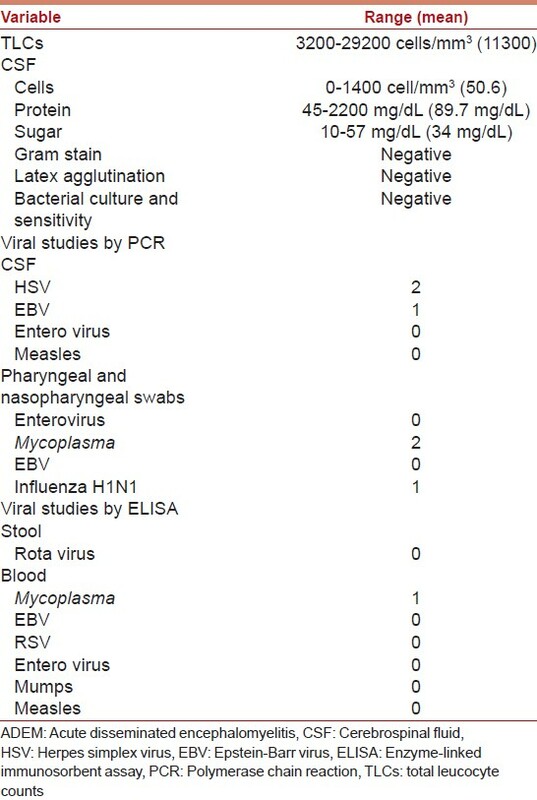 Viruses were identified in only four patients. Among twelve respiratory secretions obtained for fluorescent antibody testing, one was positive for influenza H1N1. A definite microbiologic diagnosis of HSV and EBV was established in CSF samples of three patients (two for HSV and one for EBV). A possible diagnosis of M. pneumoniae disease was made in two patients with a history of upper respiratory tract symptoms. Fifteen patients did not have any microbiologic diagnosis. EEG were performed in 13 patients; three showed generalized slowing, and two showed focal discharges. Brain CT scan revealed lesions in only one patient who had scattered supratentorial mild hypodensities in the subcortical white matter and no associated mass effect. These lesions were bilateral and asymmetric. Brain MRI was performed in all patients with T1, T2, fluid attenuation inversion recovery (FLAIR), and gadolinium-enhanced T1 images. 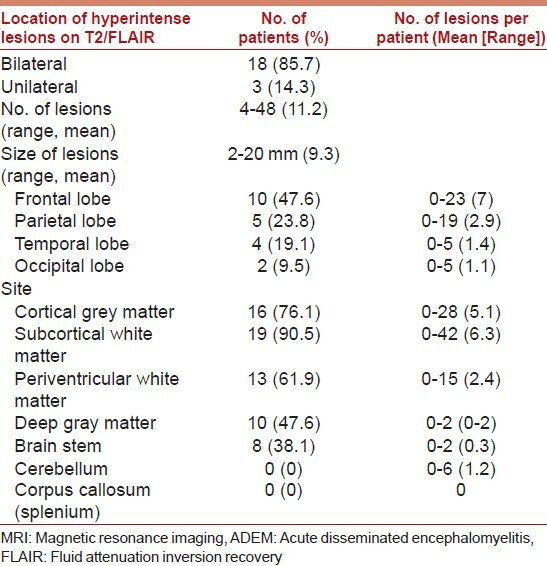 MRI findings are summarized in [Table 3]. All patients had multiple hyperintense supratentorial brain lesions on T2/FLAIR images. A total of 232 lesions were seen in the brain (mean: 11.2 per patient; range: 4-48). Most lesions were less than 1 cm but in some cases were up to 2 cm in diameter. 18 patients (85.7%) had cortical and/or subcortical white matter lesions, which were bilateral and asymmetric in location and size. In three patients, predominantly unilateral involvement of the cortical gray and subcortical white matter was noted. As regards lobar location, 47.6% of these hyperintense lesions were frontal, followed by parietal (23.8%), temporal (19.1%), and occipital (9.5%). Lesions were detected in the cerebral cortex in 76.1%, in subcortical white matter in 90.5%, in periventricular white matter in 61.9%, in deep gray matter (basal ganglia or thalamus) in 47.6% and in the brainstem in 38.1% of patients. All spinal MRI scans were normal. Follow-up MRI scan was performed in all our patients at 3 month after discharge from the hospital and may be repeated up to 2 years after discharge from hospital according to the neurological status of the patient. In only 1 of 21 patients, the MRI did not return to normal, whereas the other 20 patients MRI scan findings improved both in number and in size of lesions. One patient had urinary retention at 9 months from the initial presentation. A repeat MRI showed complete disappearance of previous lesions, but three new lesions appeared in different locations. This patient had no other neurological deficits and these new lesions disappeared on follow-up MRI scan 18 months from the initial lesion. Another patient had a repeat MRI scan at 18 months because of continuing seizures. This patient had new hyperintense lesions on T2 FLAIR in the cortical gray matter of the contralateral side with mild encephalomalacia in the right temporal lobe. However, a putative diagnosis of multiple sclerosis (MS) remains a consideration in both of the patients. Patients stayed in the hospital for duration ranged from 7 days to 31 days with a mean of 14.3 days. Eighteen patients had maximum neurological deficits on admission. Three patients deteriorated during the 1 st week of hospitalization and none beyond 1 week. None was ventilated. Treatment regimens were decided according to the clinical findings and severity of presentation. Fifteen patients (71.4%) were treated with steroids alone. Twelve patients received prednisone at 2 mg/kg/d for 7 days and tapered over 10 days. Three patients received high-dose intravenous methylprednisolone of 20 mg/kg/d within the 1 st week of hospitalization for 5 days and tapered over 4 weeks. None of the patients on steroid regimens experienced any adverse effects from steroids. Six patients received both steroids and intravenous immunoglobulin at 400 mg/kg/d for 5 days. Antibiotics were given to all our patients, and acyclovir was given to 11 patients. One patient received ganciclovir for EBV infection. Treatment was continued until the throat secretions were negative for EBV by PCR. Anticonvulsants were administered to any patient who had seizures during the course of their illnesses and only one of them required long-term anticonvulsant medication. At discharge, all patients were completely conscious, but only five patients had mild neurologic deficits (three patients with gait disturbances, one patient with paraparesis and one patient with resolving hemiparesis). Sixteen patients did not have any neurological deficits at the time of discharge from the hospital. All our patients had been seen on follow-up. The duration of follow-up ranged between 12 months and 24 months. Of the five patients who had neurological deficits at discharge, three of them were functioning normally without any deficits within the first 3-month follow-up and the other two patients had residual gait problems, which improved completely within 6-month follow-up. Only one patient had transient urine retention without other neurological defects 9 months after initial presentation and his follow-up MRI showed complete disappearance of previous lesions, but three new lesions appeared in different locations. One patient had continuing seizures and needed anticonvulsant medication. His initial MRI scan showed unilateral lesions. Follow-up MRI scans showed mild encephalomalacia in the right temporal lobe and new hyperintense lesions on T2 FLAIR in the contralateral cortical gray matter. However, he did not have any new neurologic deficits. Twenty one cases of ADEM were identified during a 2-year period in two general hospitals. Our study showed a seasonal distribution of cases as 80.9% of cases occurred in winter and spring seasons, suggesting an infectious cause that is also reported in three other studies from USA, United Kingdom and Australia. ,, In these three studies, a nonspecific infectious disease preceded the onset of ADEM in >70% of cases, which is also close to our study in 61.9% of cases. Many infectious agents, as mumps, rubella, influenza, measles, varicella, HSV, EBV, Coxsackievirus Mycoplasma, Campylobacter, Streptococcus, Legionella, and Rickettsia, have been implicated in ADEM. Despite vigorous attempts to identify microbial pathogens in the present study, only six patients were identified to have infectious agents (two with HSV, one with EBV, one with influenza virus type H1N1 and two with Mycoplasma). The failure to identify microbiological agent suggests that the inciting agent or agents are unusual or cannot be recovered by standard laboratory procedures. The present study also confirmed the overall good outcome observed in the American, British and Australian reports. ,, One hundred percent of children survived ADEM in our study and 76.2% of children were neurologically normal on discharge from the hospital and the other 23.8% were completely neurologically free within the 12 month follow-up [Table 1]. In addition, relapses occurred in only 9.5% of the patients. And there was no relation between relapse and weaning of steroid that had happened in the American study. High-dose steroid therapy was used in only 14.3% of the children in the present report, whereas 21%, 74% and 88% of children received high-dose steroids in the American, British, and Australian studies respectively. Although there were differences in treatment, but neurologic outcome, relapse rates, and MRI findings at follow-up were similar. However, our study and the other three studies ,, were designed to evaluate therapy, so it is difficult to assess the actual benefits of steroid therapy in ADEM. The present study demonstrated that ADEM in children occurs in winter/spring and closely follows an upper respiratory tract illness. MRI studies demonstrate asymmetric lesions in the cortical and subcortical white matter of the brain. Initial lesions may persist and new lesions may appear during the immediate recovery period. Clinical outcome, in general, is favorable regardless of therapy. 1. Banwell B, Kennedy J, Sadovnick D, Arnold DL, Magalhaes S, Wambera K, et al. Incidence of acquired demyelination of the CNS in Canadian children. Neurology 2009;72:232-9. 2. Leake JA, Albani S, Kao AS, Senac MO, Billman GF, Nespeca MP, et al. Acute disseminated encephalomyelitis in childhood: Epidemiologic, clinical and laboratory features. Pediatr Infect Dis J 2004;23:756-64. 3. McAlpine D. Acute disseminated encephalomyelitis: Its sequels and its relationship to disseminated sclerosis. Lancet 1931;217:846-52. 4. Murthy SN, Faden HS, Cohen ME, Bakshi R. Acute disseminated encephalomyelitis in children. Pediatrics 2002;110:e21. 5. Tenembaum S, Chitnis T, Ness J, Hahn JS, International Pediatric MS Study Group. Acute disseminated encephalomyelitis. Neurology 2007;68:S23-36. 6. Oksuzler YF, Cakmakci H, Kurul S, Oksuzler M, Dirik E. Diagnostic value of diffusion-weighted magnetic resonance imaging in pediatric cerebral diseases. Pediatr Neurol 2005;32:325-33. 7. Kuperan S, Ostrow P, Landi MK, Bakshi R. Acute hemorrhagic leukoencephalitis vs. ADEM: FLAIR MRI and neuropathology findings. Neurology 2003;60:721-2. 8. Menge T, Hemmer B, Nessler S, Wiendl H, Neuhaus O, Hartung HP, et al. Acute disseminated encephalomyelitis: An update. Arch Neurol 2005;62:1673-80. 9. Stonehouse M, Gupte G, Wassmer E, Whitehouse WP. Acute disseminated encephalomyelitis: Recognition in the hands of general paediatricians. Arch Dis Child 2003;88:122-4. 10. Krishna Murthy SN, Howard SF, Michael EC, Rohit B. Acute disseminated encephalomyelitis in children. Pediatrics 2002;110:21. 11. Dale RC, de Sousa C, Chong WK, Cox TC, Harding B, Neville BG. Acute disseminated encephalomyelitis, multiphasic disseminated encephalomyelitis and multiple sclerosis in children. Brain 2000;123:2407-22. 12. Hynson JL, Kornberg AJ, Coleman LT, Shield L, Harvey AS, Kean MJ. Clinical and neuroradiologic features of acute disseminated encephalomyelitis in children. Neurology 2001;56:1308-12. 13. Pohl-Koppe A, Burchett SK, Thiele EA, Hafler DA. Myelin basic protein reactive Th2 T cells are found in acute disseminated encephalomyelitis. J Neuroimmunol 1998;91:19-27. 14. Yeh EA, Collins A, Cohen ME, Duffner PK, Faden H. Detection of coronavirus in the central nervous system of a child with acute disseminated encephalomyelitis. Pediatrics 2004;113:e73-6. 15. Kobayashi S, Negishi Y, Ando N, Ito T, Nakano M, Togari H, et al. Two patients with acute rotavirus encephalitis associated with cerebellar signs and symptoms. Eur J Pediatr 2010;169:1287-91. 16. Chopra B, Abraham R, Abraham A. CSF beta-1 Globulin - A potential marker in differentiating multiple sclerosis and acute disseminated encephalomyelitis: A preliminary study. Neurol India 2002;50:41-4. 17. Brass SD, Caramanos Z, Santos C, Dilenge ME, Lapierre Y, Rosenblatt B. Multiple sclerosis vs acute disseminated encephalomyelitis in childhood. Pediatr Neurol 2003;29:227-31. 18. Krupp LB, Banwell B, Tenembaum S, International Pediatric MS Study Group. Consensus definitions proposed for pediatric multiple sclerosis and related disorders. Neurology 2007;68:S7-12. 1 Acute disseminated encephalomyelitis progressing to multiple sclerosis: Are infectious triggers involved? Beyersdorff, A., Schlichting, S., Stracke, S., Lauffer, H., Heckmann, M.